Welcome Chapman Sr. Born to Benjamin Chapman & Sibyl Amidon July 4, 1805 at Reedsborough Bennington Co Vt. Married Susan Amelia Risley of Madison Co, N.Y. She was born 24 Aug. 1807. In her youth the country was not thickly settled where they lived & bears would come & kill young pigs out of the pens to eat. Welcome was a cooper making barrels for the people. When they heard of the Vision of Joseph Smith they believed the Lord had manifest himself to Joseph. He (Welcome) was ridiculed by his brother & friends so he went horseback to Joseph Smith & found out for himself that it was true. Then returned for his wife & they stayed with the Mormons & went through all the perilous trials of the Saints. 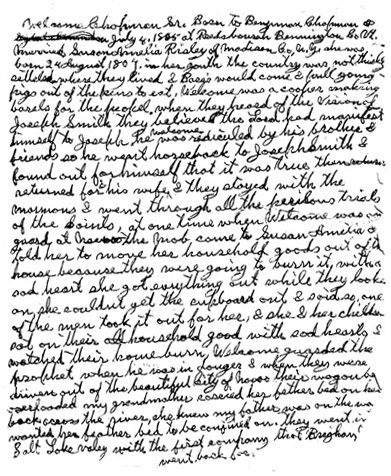 At one time when Welcome was on guard at Nauvoo the mob came to Susan Amelia & told her to move her household goods out of the house because they were going to burn it. With a sad heart she got everything out while they looked on. She couldn't get the cupboard out & said so. One of the men took it out for her & she & her children sat on their household goods with sad hearts & watched their home burn. Welcome guarded the prophet when he was in danger & when they were driven out of the beautiful City of Nauvoo, their wagons being overloaded, my grandmother carried her feather bed on her back across the river. She knew my father was on the way & wanted her feather bed to be confined on. They went into Salt Lake valley with the first company that Brigham went back for.